A drugstore foundation that claims to be lightweight, full coverage and waterproof? I have been dying to try this foundation out when it was launched, there are 45 shades that covers a huge spectrum of skin tones. The foundation claims to be a matte finish, is transfer proof and controls shine throughout the day, It is also suitable for oily, combination and sensitive skin types. I picked this up during my visit to the UK and went and got a shade match. I ended up with the shade Buff which is for light-medium skin with a neutral undertone. I got shade matched to my neck which blended in perfectly but after returning home and using it on my actual skin it is much darker. I end up using my LA Girl Pro Coverage White Foundation to lighten the shade. Looking at the shade range I am more of Vanilla than Buff especially returning to Hong Kong in this much brighter light. Packaging is simplistic with a handy controllable pump in a glass bottle. The foundation is much liquidy than I expected for being a full coverage foundation. It is definitely buildable and does cover blemishes really well but if you have red spots it tends to skip over those parts. If you have any dry patches the foundation will enhance those dry parts so you need to exfoliate well. In terms of application, I like using my beauty blender as it gives my skin moisture, I tend to use two pumps, layering more foundation on where I need it the most. I have tried not setting my face with powder and I get a little bit more glowy throughout the day but in a healthy way. It also works well with my normal concealers. For powder I normally stick with the RCMA No Colour Powder but one day I used the Rimmel Stay Matte Pressed Powder and it turned my face orange, so I have stuck with the RCMA since. Longevity wise I have worn this for 17 hours max (it was a long day!) and it looked pretty much perfect. My problem areas have always been around the crevices of my nose, which it did crease but it was minimal. I start getting a little dewy at the 9-hour mark with my Mario Badescu Facial Spray as a setting spray but my skin still looks flawless with a little healthy glow. I have very sensitive skin especially as I had a skin allergy to another product and it has not caused me any more breakouts. This has been the only foundation I have been wearing since mid-November, it gives me that flawless coverage that I am seeking and lasts all day without much fading. I have not needed to blot throughout the day which is fantastic. The shade range is also excellent, I definitely want to pick up the correct shade and maybe a darker for contouring. I have photos on Instagram: here and here - don't forget to follow me while you are there. This foundation costs £15 and $170 HKD. Oh this sounds lovely babe! Need to try it! I'm in the market for new foundations always! I've been really loving a good dewy look recently but always need to start matte. I'll keep your awesome review in mind next time I'm looking at this foundation! 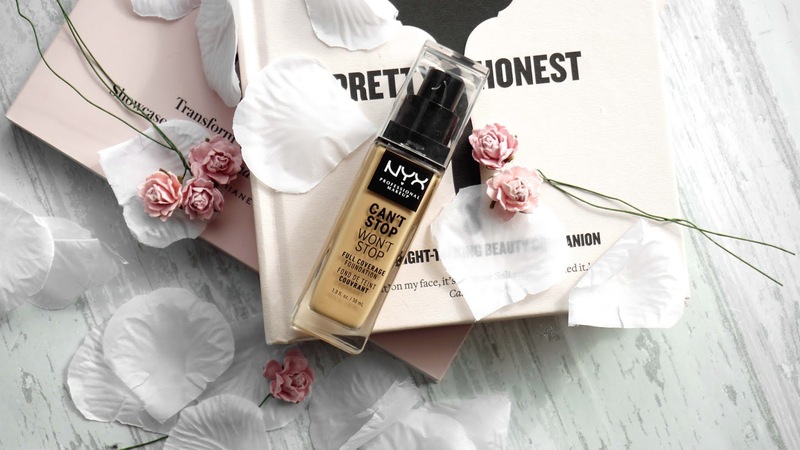 The last NYX foundation I tried was such a miss, but this sounds so good! I am just a bit weary seeing as I have dry skin sometimes. Love how you arrange your spreads xo They look amazing! Love this post. Sounds like a great product that I need to try.